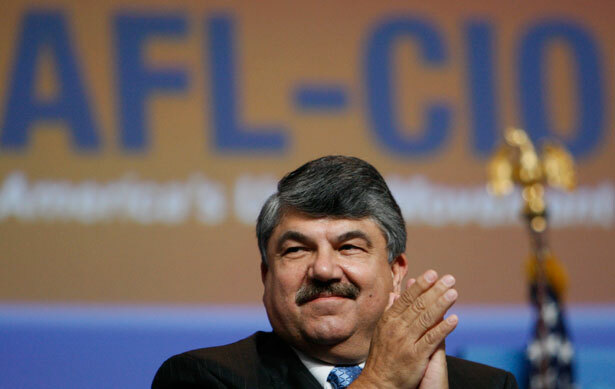 A Reboot for the AFL-CIO? At its LA convention, organized labor vowed to reinvigorate organizing and strengthen progressive alliances. And not a moment too soon. I imagine the men who merged the AFL and the CIO in 1955 would be surprised to learn that when their union federation held its 2013 convention, delegates would vote to oppose mass incarceration and eschew gender identity discrimination—and that those votes would pass with nary a speech in opposition from the floor. I don’t know if they’d find it more or less shocking that, in the intervening six decades, the unionized share of the US workforce would have dropped from a commanding one-third to an isolated ninth—and still shrinking. That crisis was the context for the AFL-CIO’s quadrennial convention in September, held in Los Angeles: historically low unionization and an attendant ebb in labor’s economic, political and cultural clout. The convention also illustrated promising trends: unions’ greater seriousness about working closely with progressive allies, and their growing openness to workers who want to be in the labor movement but can’t secure collective bargaining in the traditional manner. But it left less clear what the federation can or will do to effect the changes necessary for unions to become more potent partners to these dynamic outside groups, including more effective and intensive organizing to expand union ranks. The language ultimately approved by convention delegates largely ratified shifts toward greater community ties and cooperation that are already under way (although the message was undercut by a resolution from the AFL-CIO’s building trades unions, passed by delegates without debate in the convention’s final hours, that described the labor movement’s mission as solely about advancing members’ wages, benefits and working conditions). Those shifts are welcome ones, on several counts. First, because it’s an abdication of responsibility for a self-identified working-class movement—especially one that outstrips nearly every American liberal organization in money and membership—not to tackle the breadth of issues affecting the working class. Second, because labor’s perceived and often real estrangement from causes (and communities) beyond current union members’ compensation has fueled its isolation and vulnerability. And, third, because unions’ comprehensive campaign efforts to squeeze employers—whether through consumer boycotts or legal regulation—depend on broad popular support to succeed. The LA convention promised greater work as well with the growing array of nonunion labor groups organizing and mobilizing workers—a phenomenon I’ve called “alt-labor.” Despite reservations from some affiliates, convention delegates resolved to continue supporting, collaborating with and—pending case-by-case approval—offering formal affiliation to such organizations; they also authorized Working America, the AFL-CIO’s national affiliate for nonunion workers, to take up workplace organizing along with the political campaigns that have characterized its first decade. These, too, are good moves by the federation that largely reflect what’s already happening on the ground. Because labor law explicitly excludes growing categories of workers (from domestic workers to so-called independent contractors) from collective bargaining rights, and manifestly fails to defend such rights for others, nonunion workers are increasingly taking up strategies—from lawsuits to boycotts to strikes—to win better working conditions without formal union recognition. And unions are increasingly supporting or seeding such organizing. These alt-labor efforts face many of the same challenges as traditional union drives—including how to avert or avenge the firings of activist workers—and they have yet to yield the big numbers or economic leverage needed to reverse organized labor’s overall slide in power and influence. But they’ve been responsible for some of the savviest labor campaigns in recent years. These groups and unions have a great deal to offer and learn from one another—a potential that has not gone unnoticed by congressional Republicans, who have recently moved to crack down on such campaigns. But if the LA convention positioned the AFL-CIO as an increasingly willing partner, it didn’t assuage the fear that it’s destined to be an ever-weaker one. The AFL-CIO is in the cross-hairs of well-heeled and highly coordinated political and economic opponents, but the federation is largely the servant of its affiliate unions, only some of which could be credited with making a serious effort to overcome the present crisis. Many local unions are not only declining and defensive but dysfunctional, with leaders focused on “servicing” and satisfying individual workers’ grievances rather than engaging members or nonunion workers in a movement. Several of the most significant labor showdowns in recent years have involved a synthesis of deeply rooted community organizing (like the Chicago teachers or fast food workers) or alternative organizational models (like Walmart workers or New York City taxi drivers) with robust worker-to-worker organizing to pull off groundbreaking strikes. Not all of these campaigns can yet be declared successes. But born out of the manifest limits of traditional union election campaigns and astro-turf “air war” efforts that neglect workers (both of which were tried, and failed, against Walmart in the last decade), such efforts have shown the possibilities of true comprehensive campaigns. That’s why the moment that best captured the promise, pitfalls and ambiguity of the LA convention may have been an impassioned speech by American Federation of Teachers president Randi Weingarten, who chanted to the crowd, “Community is the new density!” (“Density” refers to the unionization rate in a region or industry, and the leverage that comes with it.) The convention—from its resolutions, to its speeches, to its attendees—illustrated organized labor’s growing commitment to such “new density,” opening to new allies in an effort to win majority support for a minority movement. What was less clear leaving Los Angeles was whether unions can reclaim the old density—forged through workers challenging co-workers to take collective action—which they’ll need in order to be the powerful partner those environmentalists and alt-labor activists require. In a recent blog post, Laura Flanders ponders what might be next for the AFL-CIO.